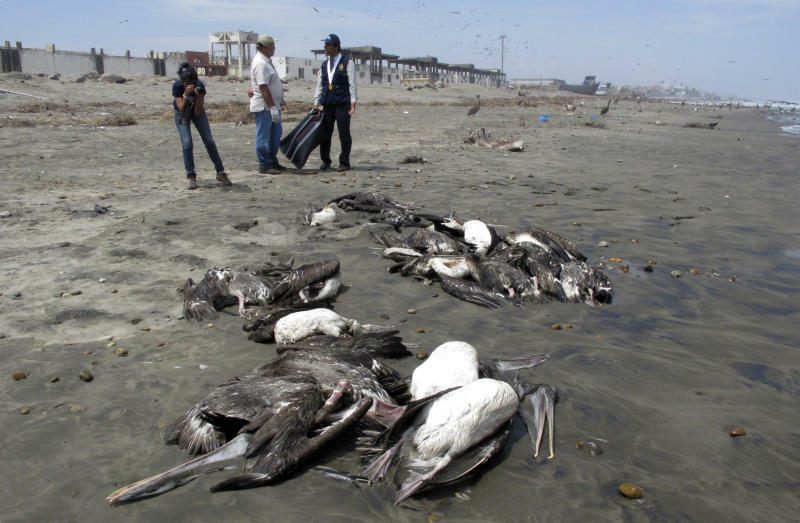 LIMA, Peru (AP) — The carcasses of dead pelicans still litter the beaches of northern Peru, even as the last of nearly 900 dolphins are cleared away. The mass die-offs have Peruvian scientists searching for a cause and environmentalists raising questions about the government's ability to protect the Pacific nation's marine life, among the world's most abundant thanks to the Humboldt current that hugs most of its 1,500-mile (2,400-kilometer) coast. After weeks of study, investigators say they think they know why at least 4,450 pelicans have died: Hotter than usual ocean temperatures have driven a type of anchovy deeper into the sea, beyond the reach of many young pelicans. But Peruvian scientists studying the deaths of dolphins and porpoises from early February to mid-April say it remains a mystery, due in part to the government's slowness in investigating the phenomenon. Authorities were so late in gathering tissues from the mammals that crucial clues were likely lost, said the scientist heading the dolphin death probe, Armando Hung, head of the molecular biology lab at Cayetano Heredia University. At the same time, local officials have been so slow in removing carcasses that the Health Ministry urged the public last weekend to stay away from beaches from Lima, the coastal capital, northward, though it did not identify any specific health issue. Up and down the coast, disoriented pelicans have been seen standing on beaches where they don't normally alight. Some have even been seen walking along coastal roadways. Beginning at the end of January, daily catches of about 5 tons of anchovetas a day by fishermen in the northern region of Lambayeque dwindled after they began finding the small fish dead on the beach, said Fernando Nique, president of the Puerto Eten fishermen's association. "After that, we haven't seen any more anchoveta," he said. Patricia Majluf, a biologist and former deputy fisheries minister, said that tongues of warm water reach into coastal zones, driving anchovetas deeper underwater where many birds can't reach them. "For a coast as dynamic as ours, it's not rare that this occurs," said Majluf. "It looks ugly because this has occurred at the same time and place (as the dolphin deaths)." 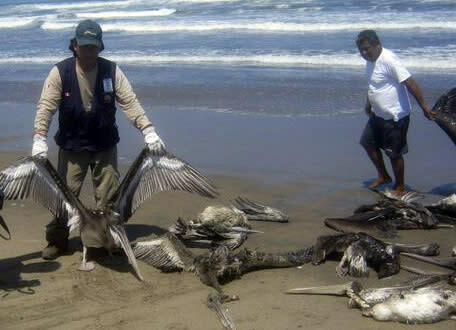 A biologist at the National University of Trujillo, Carlos Bocanegra, said his analysis of 10 dying pelicans last week supports that theory. Their digestive tracts were either empty or had the remains of fish pelicans don't normally eat. Scientists say the dead pelicans are generally young, 3-4 years old, an age in which they do not dive as deep as their elders. Ocean temperatures in the region, said Bocanegra, are currently 6 degrees Celsius (10 degrees Fahrenheit) above normal for this time of year, Peru's autumn. A similar pelican die-off happened in 1982-1983 and again in 1997-1998 when the El Nino meteorological phenomena warmed the ocean, Bocanegra said. "We saw mass deaths along Peru's entire coast, also associated with high sea temperatures. Pelicans, cormorants, Peruvian boobies and guanay cormorants died," he said. The dolphin die-off, by contrast, remains a mystery. Hung told The Associated Press that lab tests have so far ruled out a number of bacterial infections as the cause of the dolphin deaths, though other tests remain. Because the dolphins were so decomposed, Hung said, it was impossible to rule out a theory promoted by the sea mammal conservation group Orca, which initially publicized the dolphin die-off. Its director, Carlos Yaipen, says he believes the cetaceans were killed by shock waves generated by acoustic "explosions" used to test the sea bed for oil deposits. Yaipen told a congressional hearing Tuesday the ORCA did 30 autopsies of dolphins found along a 80-mile (130-kilometer) stretch of coastline, receiving the first batch on Feb. 12, and found broken bones in their ears, internal hemorrhages and collapsed livers. "In microscopic exams we found fatty tissue with a great quantity of surrounding bubbles and hemorrhages. This happens when there is a strong sound in the fatty tissue, in the mandibular fat where sounds are received," he said. The government agency in charge of the investigation, the Peruvian Sea Institute, or IMARPE, did not provide an explanation for the delay in obtaining dolphin samples for testing. "At the moment I have no answer," agency spokesman Vicente Palomino said Tuesday. Government officials have said they have no evidence the dolphin deaths are related to seismic oil exploration work that was carried out off northern Peru between Feb. 8 and April 8 by the Houston-based company BPZ Energy, and the company says it doesn't believe the deaths were related. Hundreds of dolphins have at times turned up dead on beaches in various parts of the world, though the number in northern Peru was particularly high. Scientists have said that agrochemical runoff from rivers or heavy metals from upstream mining could be potential factors in the Peru dolphin deaths. However, IMARPE's scientific director, Raul Castillo, said Tuesday that the two autopsies done for it had ruled out heavy metals "like lead, cadmium and copper" as well as pesticides and three marine biotoxins. There are more biotoxins, he said, but no local labs to test for them. Castillo said two bacteria, brucella and leptospira, were also ruled out and a test was still pending for morbillivirus, which is similar to distemper. The kit needed for that test had to be ordered from the United States and was clearing Peruvian customs. Sue Rocca, a U.S.-based marine biologist with the Whale and Dolphin Conservation Society, said blooms of algae and other biotoxins are known to affect marine mammals and could be involved. "One of the things we do know is just how fragile we have discovered our ecosystems have become," she said. Juan Carlos Sueiro, an economist who has worked in government and with public interest groups on coastal protection, said the die-offs highlight Peru's general lack of readiness for emergencies of this sort. "The resources are scarce and in a situation like this there is no procedure or team in place," he said. A larger problem, Sueiro added, is Peru's incomplete monitoring of the health of its coastal waters. Beaches are monitored during the summer by the Health Ministry, and bays and other areas crucial to the fishing industry are checked by IMARPE, an agency of the fisheries division of Peru's Production Ministry. "Peru doesn't have a policy of coastal territory management," said Sueiro. "It is probably the most backward in the entire region."